To ring in the new year, I thought I’d take a look back at some of the things I made/published in 2011. A choice few of these weren’t actually stitched in 2011, but, I’m still including them because that’s when they made their debut. You can click on the links below the collage if you’d like to see larger photos/more info. * Got a rather cute but somewhat distracting dog, who I can shamelessly dress in crochet. Ahem. 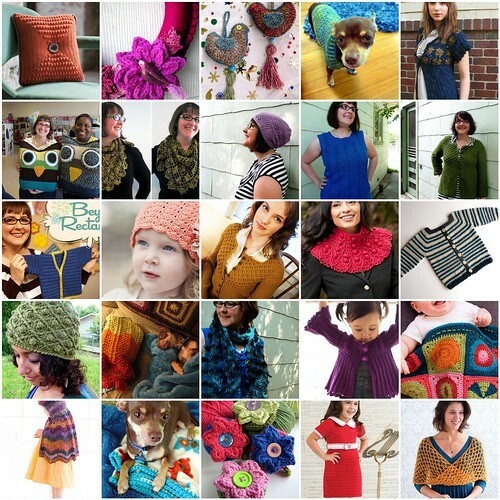 My goal for 2012 is to keep on trucking, further explore self publishing, and most importantly, keep having fun doing what I do, rather than getting stressed out about trying to become a crochet pattern producing factory. Here’s to 2012! Hi Linda! I've been following your blog for several months and just put two-and-two together to realize you are the same Linda that wrote Little Crochet. I found the book at the library and currently have it checked out to make your ribbed cardigan pattern for my daughter. I just started last night. This is the first sweater I've made, so we'll see how it goes. The reviews on ravelry say it's a great pattern for beginners, so I'm hopeful. I just wanted to thank you for your wonderful designs. I love your modern style and look forward to seeing more from you! Thanks, and good luck with the sweater! Such an inspiring collection of your beautiful 2011 achievements! Thanks for sharing this with us! :-D Happy New Year!!!! Wow, that's something to be very proud of! Well done Linda!